I confess; I’m feeling more than a little dazed and overwhelmed today. 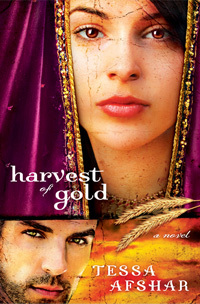 Last night, my book, Harvest of Gold, was honored with the 2014 Christy Award for Best Historical Romance. I am so blessed to work in an industry that honors Jesus. And the Christy feels good too! A bit about the Christy Awards: They honor and promote excellence in Christian fiction. The fifteenth annual presentation was at the Atlanta Marriot Marquis. Here’s the official press release. I’ve been buzzing around the convention center in Atlanta, taking in the sights and sounds of the International Christian Retail Show (ICRS), the world’s largest gathering of Christian authors, musicians, and artists. On top of all this excitement, my fourth novel, In the Field of Grace, releases a week from today, on July 1. But I’ve decided to start celebrating now, and I invite you to join me. Starting tomorrow – Wednesday, June 25 at 8 a.m. Eastern Time, I’ll be giving away a copy of In the Field of Grace daily through Friday on my Facebook page. Entering is super-easy. Each day, I’ll give you a prompt, and all you need to do is like the update, fill in the blank, or answer the question. I’ll announce each day’s winner on my Facebook page after 8 p.m. Eastern Time. Starting July 1, my book’s official release date, I’ll be hosting a sweepstakes on my Facebook page. You’ll have the opportunity to win some super prizes, such as an Apple iPad Mini, gift card, book bundles and more. Be sure to visit my Facebook page https://www.facebook.com/AuthorTessaAfshar daily from July 1-18 – you can enter the contest once per email address per day! I’m glad you asked. It’s the story of Ruth and Boaz – a love that ultimately changes the course of Israel’s destiny and the future of the whole world. Visit my website and click “Read Sample Chapter” to read the Prologue and Chapter 1. If you enjoy it, the document includes sharing buttons for Facebook, Twitter, and Google+, and you can also embed it on your own blog. Congratulations -what an honor to win a Christy award! Cynthia, that is the perfect way of putting it. I feel truly honored. Congratulations! You more than deserved the Christy award. You had me from PEARL…and I can’t wait to read Ruth and Boaz’s story! Thank you for your wonderful story-telling! Dorothy, you cracked me up! So glad I had you at Pearl. Hope I’ll have you to the last page of my last novel, whenever that comes . . .
Lol! I had typed out this long reply and forgot to fill in my info. When I went back to fill that in, my post was all gone…boo! I am waiting for a call back from The Salt Cellar for your book. So hoping it arrives before this weekend as I’m taking some time off and would love to be able to catch up on my TBR pile! I know one that will go straight to the top…lol! I am so so so happy for you!!! This really made my day, as I love that book and you as an author. 🙂 (I reread it just two days ago) Congratulations!! That’s so sweet, Rachel. Can’t tell you how much I appreciate the rereads and support. Well deserved, Tessa! Your books show the hard work & dedication you pour into your writing, as well as your love for Him. Congratulations! Thank you, Melinda. I appreciate your encouragement.